Pest description and crop damage Diamondback larvae are smaller than most other caterpillars in cole crops, about 0.31 inch when full grown. The larval body is wider in the middle and tapers at both ends, with two legs (prolegs) on the last segment forming a distinctive V-shape at the rear end. When disturbed, the larvae wiggle frantically or rapidly attach a silken line to a leaf and drop over the edge. Larvae feed mostly on outer or older leaves of older plants, chewing out small holes, or at the growing points of young plants. They also feed on floral stalks and flower buds. Adult moths are small, slender, and grayish brown. Male moths display three diamond-shaped markings on their back. In the Pacific Northwest, the damage from diamondback moth is not so much from feeding as from contamination by pupae. Late stage instars crawl into stems infesting harvested crops. Biology and life history Cabbage is the preferred host, but it also attacks all cole family crops. The adult overwinters in trash in and around fields. Adults emerge in May and early June and lay eggs singly or in twos or threes mainly on the upper sides of leaves. The eggs are minute. They hatch in 4 to 8 days. 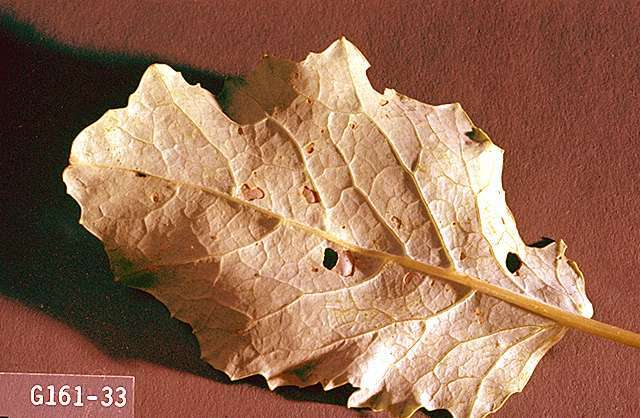 Larvae feed mostly on the undersides of outer or older leaves of older plants, chewing out small holes, and mature in 10 to 30 days. They then spin loose white cocoons, which they attach to leaves or stems, and pupate within them. Adults emerge in 10 to 14 days. There may be two to four overlapping generations each year. 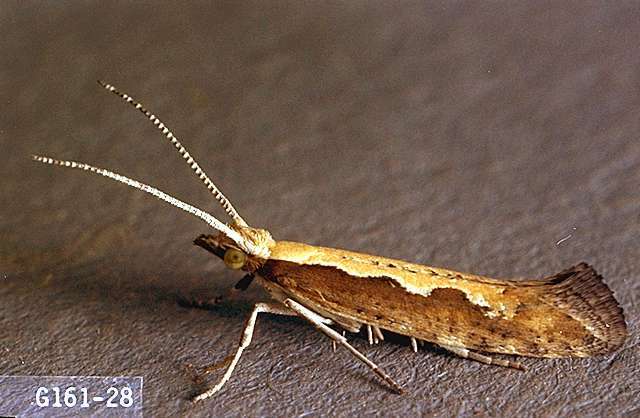 Pest monitoring Natural enemies and insecticides applied to control other pests keep the diamondback moth under satisfactory control in most fields, but keep records of diamondback moths as you monitor for other caterpillars. Adult moths frequently migrate from fields being harvested or disked under. 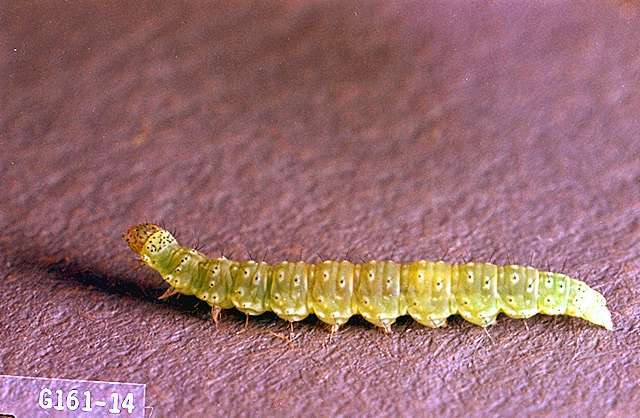 In Minnesota, the action thresholds for diamondback moth in cabbage are: Where diamondback moth is the primary insect pest (usually early-year), before cupping, treat with Bacillus thuringiensis if 50% of plants are infested with five or more larvae each. After cupping, treat if 10% of plants are infested with one or more larvae each. Bacillus thuringiensis (Javelin)-See product labels for rates. PHI 0 days. REI 4 hr. Slow acting. May need multiple applications. Add an appropriate spreader-sticker to enhance control. Most effective on small larvae. Some formulations are OMRI-listed for organic use. bifenthrin (Brigade 2EC, Sniper) at 0.033 to 0.1 lb ai/a. PHI 7 days REI 12 hr. Retreatment interval 7 days. Do not exceed 0.4 lb ai/a per season. chlorantraniliprole (Coragen) at 0.045 to 0.065 lb ai/a as soil, chemigation or foliar treatment. PHI 3 days. REI 4 hr. Limit 4 treatments per crop. Retreatment interval 3 days foliar, 10 days drip chemigation. Do not exceed 0.2 lb ai/a per season. cryolite (Kryocide) at 7.7 to 15.4 lb ai/a. PHI 14 days. REI 12 days. Do not exceed 92 lb ai/a per season. Collards only. OMRI-listed for organic use. cyantraniliprole (Exirel) at 0.045 to 0.88 lb ai/a. PHI 1 day. REI 12 hr. Retreatment interval 5 days. Limit 6 treatments per year. Do not exceed 0.4 lb ai/a per year. indoxacarb (Avaunt) at 0.045 to 0.065 lb ai/a. PHI 3 days. REI 12 hr. Do not exceed 0.26 lb ai/a per crop. Limit 5 treatments per year. Retreatment interval 3 days. methomyl (Lannate SP) at 0.45 lb ai/a. PHI 10 days. REI 48 hr. Do not exceed 5.4 lb ai/a collars per year. Fresh market Collards only. naled (Dibrom) at 0.94 lb ai/a. PHI 1 day. REI 48 hr. Retreatment interval 7 days. Do not exceed 9.4 lb ai/a per year. spinetoram (Radiant SC) at 0.039 to 0.078 lb ai/a. PHI 1 day. REI 4 hr. Retreatment interval 4 days. Do not exceed six applications or 0.266 lb ai/a per year. Do not apply to seedling cole crops grown for transplant within a greenhouse, shade house, or field plot. spinosad (Success, Entrust SC) at 0.023 to 0.063 lb ai/a. PHI 1 day. REI 4 hr. Do not exceed six applications or 0.45 lb ai/a per crop. Entrust SC is OMRI-listed for organic use.